The origin of the Merseyside Police Mounted Section’s logo is a story of spontaneity, affection and the legacy of one police horse in particular – Murphy’s Law. 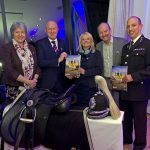 In March 2018, the “Stand Tall” campaign was formally launched and this saw the Mounted Section undergo a rebrand which included the creation of a new logo. But where do you draw inspiration to create a logo for the oldest mounted section outside of London? A logo that reflects the heritage of the section – from its formation in Liverpool in the last century, to the community links forged across the whole of Merseyside. It’s a tall order, but as fate would have it, something truly inspirational had happened the previous August. On a sunny day in August 2017, Police Horse Murphy’s Law and his rider, Constable Jenny Slade were on patrol in the Baltic Triangle area of Liverpool. When they passed a newly-painted wall mural by local artist, Paul Curtis, the opportunity to pose briefly in front of the artwork was too good to miss. Murphy’s Law was accompanied by Police Horse Arnie and rider, Constable Alison Armitt. 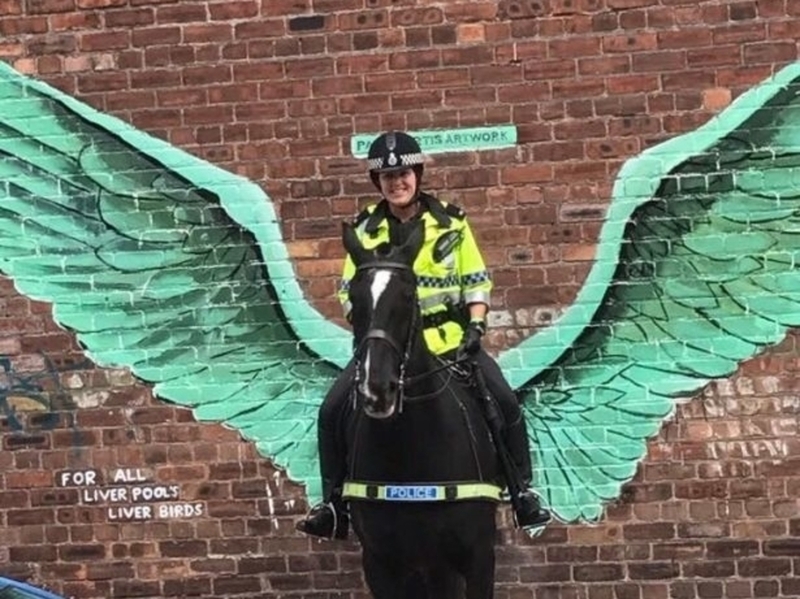 Each officer photographed the other in front of the painted Liver Bird wings and shared the images via the Merseyside Police Twitter account. The reaction to the tweet was huge. There was something about the image that the communities of Merseyside connected with immediately, resulting in hundreds of likes and tweets. The public undoubtedly likes to see mounted officers patrolling in their area, but officers and staff in the Mounted Section, and other departments across the force, were taken aback by the scale of the response. What happened next was even more unexpected. Murphy’s Law sadly died following a sudden illness just one week after he was photographed in front of the wall mural. He was due to retire later that year, following 14 years of loyal service. Police horses and dogs are our colleagues. The bond formed with these brave and faithful animals by the people they work closest with is incredibly strong. As you can imagine, Murphy’s absence at the stables was felt by all that worked with him. As the daily duties of the Mounted Section continued, the sad news about Murphy’s Law reached a wider audience via social media, local press and even Horse and Hound magazine. The subsequent outpouring of messages from members of the public across Merseyside quickly became a moving tribute and fond farewell to Murphy’s Law. It’s no surprise that when the time came to design the Mounted Section’s logo, inspiration came from that one fateful photograph and the sense of pride it generated from members of the public and police. Murphy’s brief social media fame was only really a snapshot of his long service. We’d like to share a bit more about this popular police horse. Murphy’s Law came to Merseyside Police at the age of five years old, gifted to the force by a couple in Cheshire. He served with the section for over 14 years and is described as a kind and affectionate horse with a big character. He liked a good sleep, but when duty called, he was versatile and a good all-rounder. He was part of the special team of horses that serve the communities of Merseyside for many years. He will be greatly missed by all the team. Murphy was renowned for having an unruly mane. Combined with his enjoyment of a nap, keeping his “bed hair” tidy meant having his mane trimmed short to keep him looking presentable for duty! He was once injured while policing a football match. Having been stabbed superficially, he did not flinch or react at all, carrying out his duties with dedication. Murphy was lovable and brave. At 16 hands, he was our smallest police horse but he had the heart of a lion. He’ll always be remembered standing tall.